My original color scheme for the bathroom was quite different than what I'm ending up with. 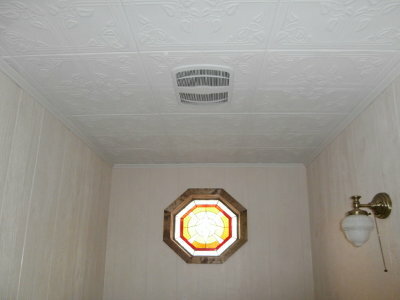 Originally, I planned a medium wall color, and white trim. Because the room is so small, however (7'3" by 5'4"), I decided to go with light walls instead. The ceiling, tub interior, sink, and toilet are all white, but I wasn't sure if I wanted the window trim and vanity in white as well. We decided to stain them. I think the darker color really sets off the stained glass window, don't you? We'll probably stain the mirror frame too. That and the vanity are a few steps down the road however. The floor is next. Click here for that. I love the stained glass window. The stain trim really looks nice. I really enjoy following your blog. We also have small acreage. I enjoy canning from the garden, we have chickens, 3 horses, 1 pony, 2 large work horses, and 2 mules. I would love a milk cow, but can't talk my husband into it. Still trying!! I also hand quilt and wood working. We stay pretty busy for retired couple. Gorgeous Leigh; the lighter walls with the dark-stained trim around the window really makes it 'pop'! Oh, I do like it stained! It really makes it POP :) Great job! Perfect choice, Leigh! I love seeing your reno projects take shape - it's like watching a continuing season of "This Old House"! My husband and I love that show. Beautiful choice!!! The stain around the stain glass window makes this window pop in the room. Thanks ya'll. Your comments are always so encouraging. Rosanne, welcome! Sounds like you have quite a few good animals. Do you blog? Barb, grounding the room. I like that. I'm hoping the tile we chose will do just that. Absolutely gorgeous piece of work. Makes a beautiful focal point. You guys do great work! I think the stain was a superb idea. I'm sure I visited your blog via The New Season as Julene is my sil. I love reading about people's projects in homesteading and self sufficiency. The window is wonderful--brings in happy light. I think the stain looks good against the stained glass window. When I was younger, I loved the natural wood look but as I age, I find myself gravitating away from the natural look to painting it some shade of off white. I am right in the midst of painting all my kitchen cabinets this way. I'm not sure if it is my changing tastes or the tastes of those around me. 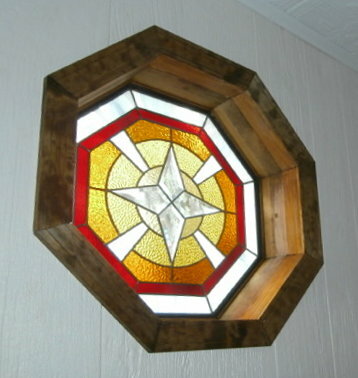 We have an Octagon window in our bathroom, but not with stained glass. At the time I never even thought about that option. Sure wish I had! Yours is so pretty--way to go! That window is just stunning. The color surrounding it frames it perfectly. What color will the walls be painted? Or are they staying white too? That gold color splashing against the wall in your picture would be pretty . . . giving a cozy warm feeling when you walk in. As usual, you guys amaze me! Sorry Leigh, I don't blog. But I will continue to enjoy your process. the stained trim does indeed make the window pop. Mary, Starlighthill, FFG, and DFW, thanks! Willow, yes, I think it was through Julene. I really enjoy her blog and was happy to find you too. Susan, thank you! I'm just happy the room seems to be working out. The contrasting stain is very nice! The window is perfect and casts a lovely light into the room. That is so pretty! T.
Julene, I love stained glass for that reason. Never thought we'd be fortunate to have any though! Jen, thanks! We're moving as fast as we can. I have to admit we'll both be glad when the house is done! Repairs and upgrades are needful, but both Dan and I would rather be outside. Tina, thank you! So good to hear from you! Nice stained glass window you got there for your bathroom. 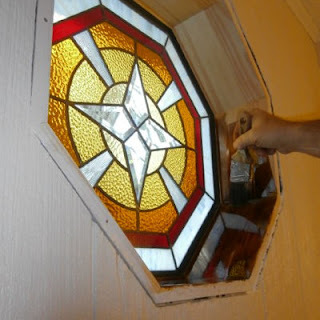 I'm also planning to make some tending to our bathroom window and to our iving room's glass door. Do you think there's a need for me to consult to a licensed general contractor before creating any changes to our home? Dylan, that depends upon how comfortable and experienced you are with the necessary construction techniques and the process, as well as your familiarity with your area building codes. If you have any doubts and can afford it, consulting with professionals would be a good idea. We are now moving to our new house and I can't be more excited to add my personal touch to the rooms. This one is very inspiring. Thanks for the heads up!